Apulia the ideal place for relaxing holidays from summer time through to September. 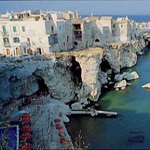 Hotel reservation in Apulia - Italy - Accomodations Booking for your holidays. On the extreme tip of the Gargano and stretching towards the Adriatic sea, Vieste is a small characteristic town whose modern district offers bathing establishements, and hotels ready to satisfy the needs of Tourism in any season. The historic centre of ancient origin (here necropolis dated III century as a well as ruins of megalithic walls are preserved) rises on a sheer cliff towering over the sea. Its castle standing on the highest part of the town, was built by will of Federico II in 18th century, The Cathedral, in the same area, might have been built on the ruins of a very ancient temple of prechristian times. Particularly attractive is the seaside area around Vieste, with its caves, rocks and cliffs. Moreover, in its surroundings there are woods with clear fresh air oxygenated by pine-trees, oaks, olives and other high-stem plants, which contribute in making a visit here a most relaxing and pleasant one. The town is also a place of History, legends and mythological and historic events, allowing the tourist who like to discover ancient traces to spend a profitable stay. At present the inhabitants are 12,000.